At the invitation of Right Worshipful Master Brother Tom Campbell and the Office Bearers and Brethren of Lodge Bannockburn Bruce and Thistle No 312, a deputation from Provincial Grand Lodge landed on Lodge Bannockburn on Friday 13th June 2008 to confer the Entered Apprentice Degree on 1 candidate. The deputation from Provincial Grand Lodge headed by the Right Worshipful Provincial Grand Master Brother John McKenzie, accompanied by Brother Andrew A McKinnon, Worshipful Depute Provincial Grand Master, Brother H Graeme Russell, Provincial Grand Secretary and some 13 other elected and honorary members of Provincial Grand Lodge who were warmly received into Lodge Bannockburn by the Right Worshipful Master Brother Campbell and the Brethren assembled. The Right Worshipful Provincial Grand Master, already a little up tight about the work he and his team were about to carry out, was surprised by the Right Worshipful Master as prior to the Degree being conferred, he was presented to the Brethren assembled and honoured by Lodge Bannockburn Bruce and Thistle No 312 with Honorary membership of the Lodge. The Right Worshipful Provincial Grand Master thanked Brother Campbell and the Brethren of Lodge Bannockburn for this honour. Upon returning to the East Brother McKenzie was presented with the Gavel and assumed the Chair of the Lodge. The Degree team on the evening was of course headed by the Right Worshipful Provincial Grand Master ably assisted by Brothers Robert Hunter WSW, Colin Alldritt WJW, Alex Crockett SD, Alan Scott JD, Reg Weston DOC, Stuart Stirling IG, Gordon Sewell, Iain Macdonald, Allan Leishman, Brian Wright and Brian O’Connor. The candidate that evening was Mr William Buchan, who was initiated into Freemasonry in due and ancient form by the team from Provincial Grand Lodge. 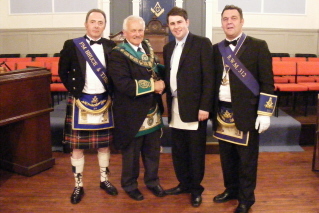 At the conclusion the Right Worshipful Provincial Grand Master and the Right Worshipful Master of Lodge Bannockburn congratulated the candidate and welcomed him into Freemasonry. The Right Worshipful Provincial Grand Master thanked and congratulated his team of Office Bearers for their work and returned the Gavel to the Right Worshipful Master Brother Campbell. Brother Campbell congratulated and thanked the Right Worshipful Provincial Grand Master and his team on an excellent Entered Apprentice Degree. After the formal meeting was concluded, the Brethren of Provincial Grand Lodge and the Brethren assembled enjoyed the hospitality of Lodge Bannockburn at the harmony which followed.